A dragon and lion dance group from Suixi county in Zhanjiang wowed the crowd during two performances held in Luoyang on April 9 and 10. As the 37th China Luoyang Peony Cultural Festival drew the curtain in Luoyang, central China's Henan province on April 5, the Suixi lion dance team was invited to perform on stage during the event and communicate with local artistic groups. On April 9, the lion and dragon dance team performed at Luoyang Zhouwangcheng Square with 10 other national intangible cultural heritage shows including Shaolin Kungfu and Sichuan Opera Face-changing. 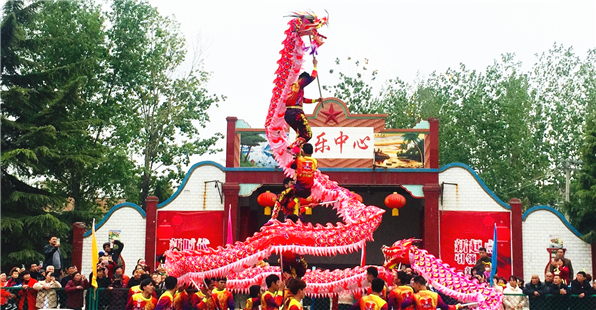 The following day, the dancers were invited to stage shows in Guxian village in Yanshi of Luoyang. The performance, featuring powerful, delicate movement, flexible footwork, and a thrilling plot, won great acclaim from local residents. Yanshi is one of the starting points of the ancient Silk Road in the east and was also home to the Hakka ancestors before they migrated south of the country. Guxian village is an ancient village that has a history dating back over 1,000 years and enjoys great popularity of its national intangible cultural heritage, the Heluo Drum. The cultural departments of Yanshi and Suixi reached an agreement on multiple cooperation and exchanges of intangible cultural heritages to promote the development and protection of traditional culture and the development of the cultural tourism industry.